"My name is Juliette, and I survived the apocalypse. You think I'm lucky? You're wrong." A trailer has debuted for an intriguing post-apocalyptic creature feature titled Hostile, the feature directorial debut of French filmmaker Mathieu Turi. Not to be confused with the Christian Bale western Hostiles, this one is about a woman who is the lone survivor of an apocalypse and ends up crashing her truck driving around. She wakes up at night, and must battle strange creatures that roam the wastelands in the dark. The cast includes Grégory Fitoussi, Javier Botet, Jay Benedict, and David Gasman. This kind of looks like I Am Legend if it was set in a dusty wasteland instead of the city. This actually looks pretty good. Check it out. Juliette (Brittany Ashworth), a lone survivor of an apocalyptic era, fights to survive against hunger, thirst, a broken leg and strange, disturbing creatures that only comes out at nighttime. 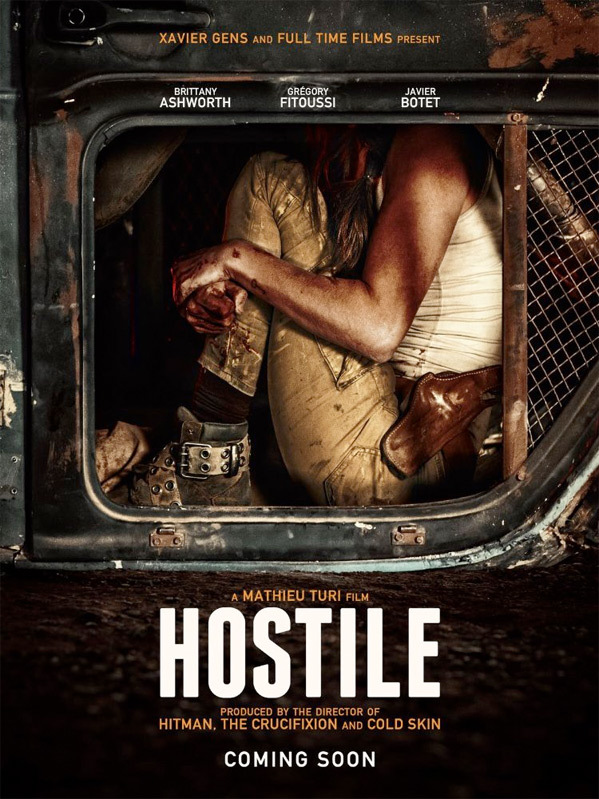 Hostile is both written and directed by French filmmaker Mathieu Turi, a former assistant director making his feature directorial debut after a few short films previously. This first premiered at the Neuchâtel Fantastic Film Festival in Switzerland, and has played at a few other film festivals this year including at the Sitges Film Festival and FilmQuest Festival. This still doesn't yet have any official release date set yet, so stay tuned for more updates from here. Follow Turi on Twitter @MathieuTURI. Who's interested? So what do you think?